Excellent condition and worked well when removed. They have been in storage since. Yours for the taking. The circuits use the factory L pads (or you can bypass them with resistors), and the boards bolt into the existing holes in the bottoms of the L300 cabinets. (I'm not sure whether they line up with the 4333 mounting.). This is an original OEM product. Part # 353342-002. JBL 3105 crossovers, tested and working. L-Pads were replaced and one of the labels is missing. Shipped with USPS Priority Mail Medium Flat Rate Box. Crossovers are loaded with premium components and are fully functional. 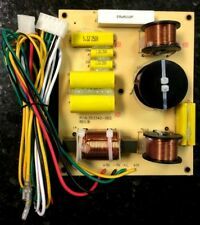 Excellent restoration part for your JBL speakers or DIY project. Local pickup in. County with cash is always available. County with cash only. JBL N24 SPEAKER CROSSOVERS SET OF 2 . EXCELLENT CONDITION. 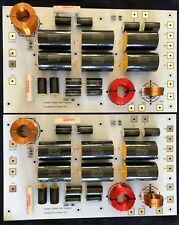 Pair of vintage JBL frequency dividing networks model 3110A. Tested and all functions working including the high frequency boost and volume control. There are a couple extra holes drilled into one of the units, please see photos. JBL crossover networks removed from working JBL SR 4725 speaker systems. In bi-amp mode, HF passive crossover wires removed from switch to allow unfiltered bi-amp mode. JBL L110 Crossover Network with Brilliance Controls/Knobs & Mounting Screws. Shipped with USPS Priority Mail Medium Flat Rate Box. This is an original OEM product. Part # 353340-002. Single Vintage JBL 3110A Frequency Dividing Network Model (Crossover). Tested and all functions working including volume control and high frequency boost. JBL N2400 crossover. JBL 075 and JBL woofer. for the crossover. made in the 1960's. OR it does not work. to use with. JBL SR 4722 A series two crossovers . Condition is Used. JBL N1200 Crossovers Only! Fully working units but may need the switches cleaned if planning on daily use. Please examine photos as they are a large part of the description. Free shipping in the contiguous US! JBL SR series, JBL SRX series, JBL concert series, Peavey SP4G, Peavey DTH4 ,Peavey DTH 4215 and any other 2 way line array speaker system with a dual woofer and a horn. JBL type 2 way high power speaker crossover for dual woofer and horn. It was for JBL Studio Series l820. JBL L100T Crossover. Shipped with USPS Priority Mail. Picture is of actual item. For sale is a pair JBL 4301 CROSSOVERS 2 ways. They are freshly removed from good working enclosures. Replacement Speaker Crossover 2000 Watts WORKS FOR JBL, Peavey, Cerwin Vega, Pyle-Pro, mr, MANY BRANDS EMB CX-21! features: 1 DJ / home audio 3-way crossover network Best Replacement For JBL, Klipsch, B&W, Warfedale, EAW, EV Many Other Max power: 2000 Watts Impedance: 4 or 8 Ohm Crossover frequency: 625Hz - 5,000Hz.